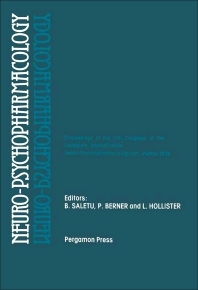 Neuro-psychopharmacology covers the proceedings of the 11th Congress of the Collegium Internationale Neuro-psychopharmacologicum, held in Vienna on July 9-14, 1978. The book focuses on the processes, methodologies, and approaches in neuropsychopharmacology. The selection first offers information on the long-lasting effects of electroconvulsive therapy (ECT) on monoaminergic mechanisms and enhanced monoamine behavioral responses following repeated electroconvulsive shock to rats and their relevance to ECT. The book also underscores the ECT effects on mineral metabolism and neuroendocrine function. The publication reviews the genetic components in the mechanism of action of lithium; genetics and lithium ion metabolism in affective disorders; and pharmacogenetics and the pharmacologic challenge strategy in clinical research. The text also examines the influence of peptides in affective disorders and HLA antigens in affective disorders and cycloid psychoses. Discussions also focus on the biological and clinical basis of the therapeutic effects of benzodiazepines; effects of benzodiazepines on the electrical activity of the central nervous system; and diazepam metabolism in healthy subjects and patients with heart failure, renal failure, and hepatic cirrhosis. The selection is a dependable reference for readers interested in neuropsychopharmacology. EEG Effects of Clozapine: Assocation or Dissocation of EEG and Behavior?